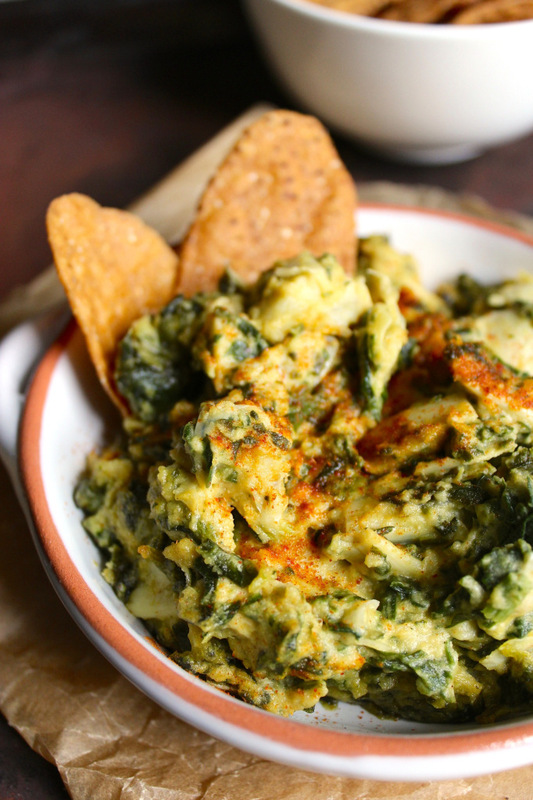 This spinach artichoke hummus recipe is savory and creamy, with subtle spice. It’s loaded with healthy chickpeas, spinach, and nutritional yeast. Artichoke is one of the best foods ever grown, if you ask me. 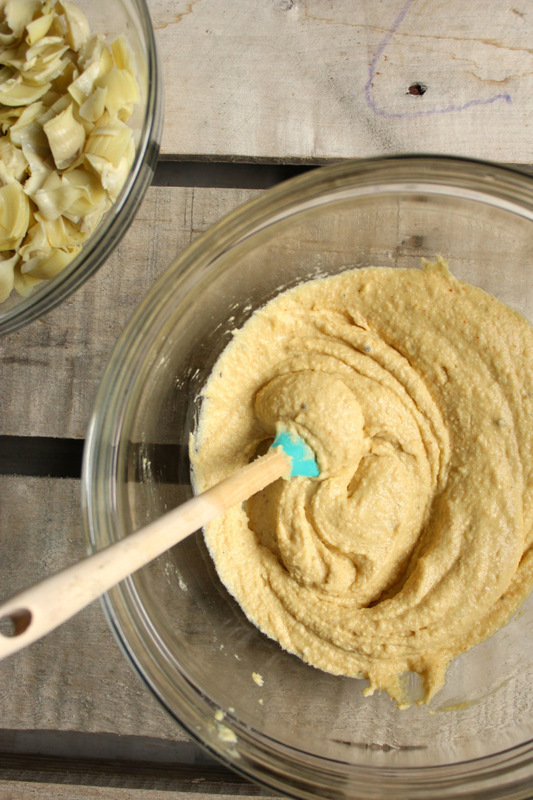 Its bold, savory flavor puts it in a food category all its own and makes this hummus downright delicious. 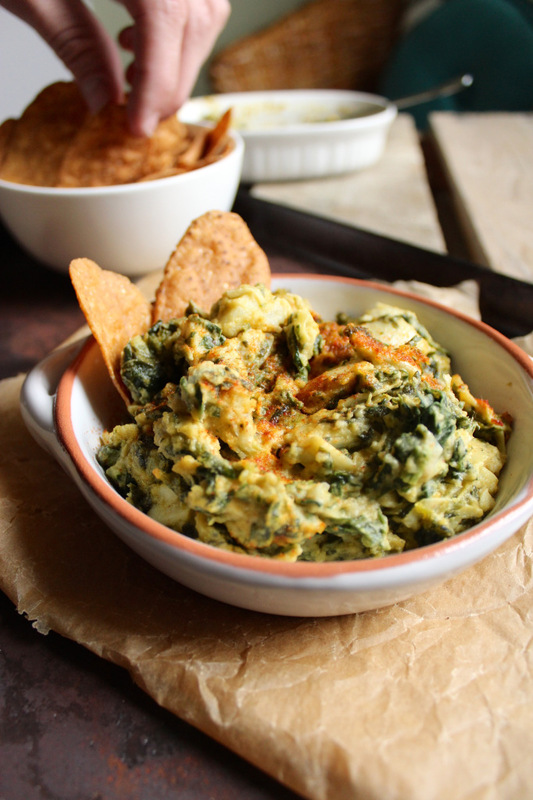 Tangy and smoky with generous hunks of artichoke and spinach mixed in, this warm dip helps take the edge off of winter. Half of the year, I’m a hummus and ranch dip kind of person and the other half of the year, I’m all about baked, hot dips like this one. And if you’re wondering about guacamole, well, that’s a year-round thing. During the cold, dark cave that is winter, I’m not as inclined to reach for healthy raw vegetables and fruits to munch on. It’s a tough time of the year to eat mindfully, what with cookies here and casseroles there and candies everywhere. 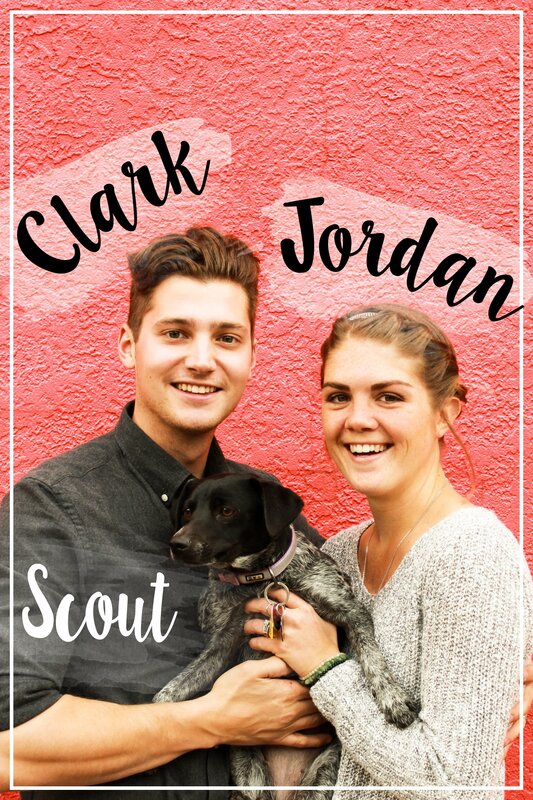 But I find that if I keep some kind of healthy, warm dip on hand, along with washed and chopped veggies for snacking, I’m not as tempted by empty calories. Filling up with the good stuff means there’s less room for the bad. 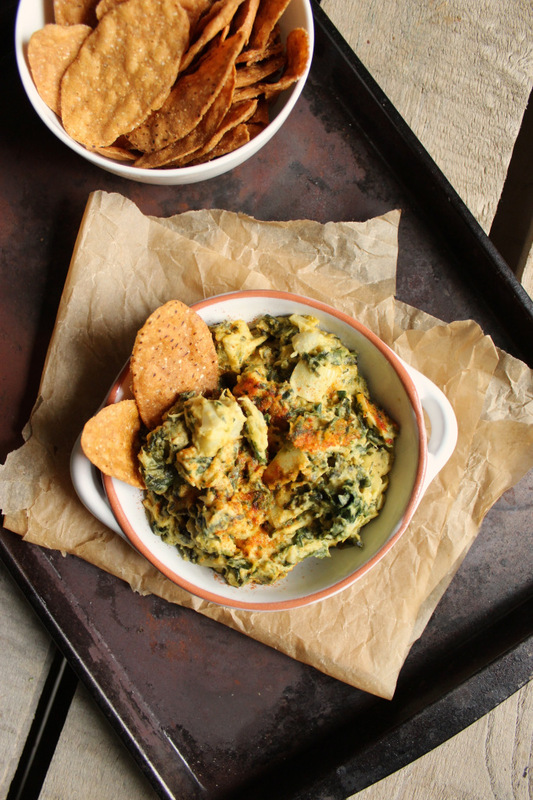 Clark’s mom makes a dynamite spinach artichoke dip which we got to try for the first time a few weeks ago and that’s what inspired this spin on the classic. Since we’re not big on dairy, especially right in the midst of cold and cough season, we opted for tahini and chickpeas instead of cheese. 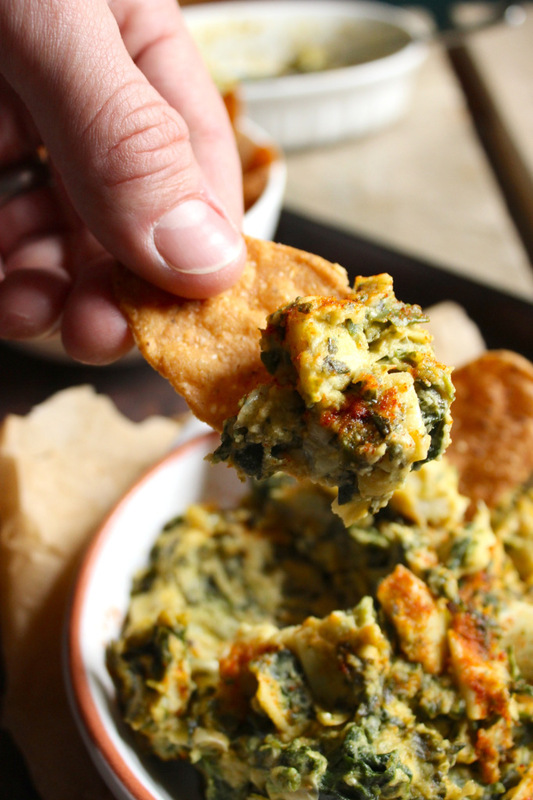 The result tasted like traditional spinach artichoke dip invited hummus to a party and they made a baby. I recommend serving this dip with broccoli, celery, red bell peppers, and sweet potato chips anywhere that you want to shock people’s tastebuds [which is everywhere, all the time, am I right?]. 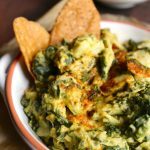 Savory and creamy, with subtle spice, this dairy-free spinach artichoke hummus is perfect for cold winter days. Thaw spinach and drain in a colander. Smash it between a paper towel to remove as much water as possible. In a blender, add chickpeas, tahini, olive oil, lemon juice, garlic, and veganaise. Blend until smooth, using a rubber spatula scrape it off the sides when necessary. Empty the contents into a bowl, add salt, pepper, cayenne, and nutritional yeast and mix to combine. 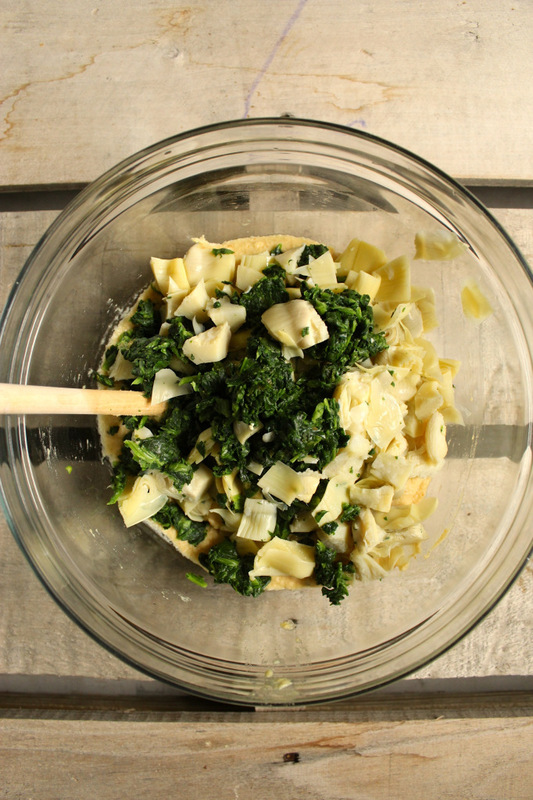 Drain artichoke hearts and roughly chop into smaller, bite-sized pieces. 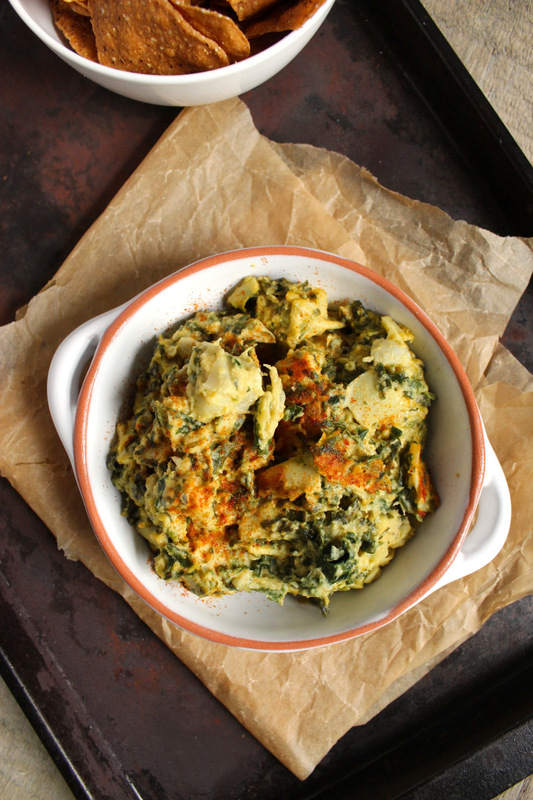 Fold in spinach and artichoke hearts. Grease a 6-inch ceramic baking dish with olive oil and empty the dip into the dish. Bake for 10-15 minutes until the top looks golden brown and the edges look hot and bubbly. I did not see the vegenaise listed in the ingredient list. This looks like an awesome recipe. I need to try it soon. Whoops – sorry! It’s been added in there now. 3 tablespoons will do the trick! :) Let me know how you like it.